It’s been a big year, and now, hot on the heels of Cie. Käfig’s electrifying performances this past weekend, we are pleased to announce our 2015-16 Season! Companhia Urbana de Dança will make its Canadian debut, and we’re thrilled to welcome back Hofesh Shechter with a new work. We’re also very excited about next February’s presentation of Vancouver’s own Crystal Pite and her company, Kidd Pivot, in their groundbreaking collaboration with another Vancouver innovator, Electric Company Theatre. 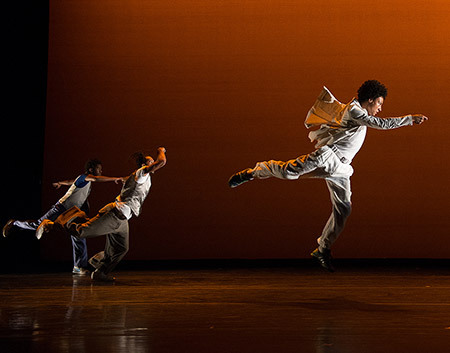 In 2009 Hofesh Shechter wowed Vancouver audiences with Uprising and In your rooms. He returns once again in November 2015 with a trilogy of captivating new works. Shechter’s choreography is at once charismatic and beautifully intricate, seductive and intelligent. With barbarians, Shechter offers three distinct pieces imbued with his signature style. The complex beauty of baroque music inspires a sparse world in which dancers move with mathematical precision. A percussive score drives a fluid, almost urban movement vocabulary, inspired by groove and darkness. A new duet is flavoured with the quirky and unique performance styles of each dancer. 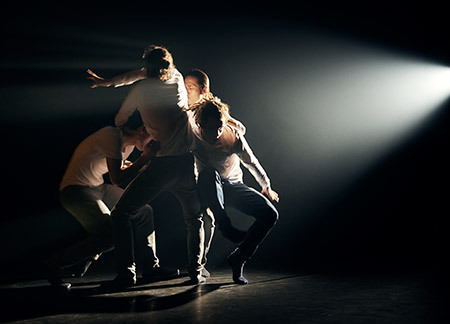 barbarians is an extraordinarily elegant and intimate offering from one of the world’s most sought after choreographers. Hofesh Shechter Company, the barbarians in love. Photo by Jake Walters. Two of Canada’s most ground-breaking performing arts companies have come together to create Betroffenheit, an innovative, boundary-stretching hybrid of theatre and dance. Betroffenheit is a unique creative collaboration by Kidd Pivot artistic director and choreographer Crystal Pite, and Electric Company Theatre co-artistic director, writer and performer Jonathon Young. Taking its title from the German word Betroffenheit, it describes a state of shock and bewilderment that encompasses you in the wake of a disaster. Betroffenheit takes you to a timeless, liminal space where you return again and again even as you struggle to gain and maintain distance, and where you keep responding to the disaster long after it has subsided. Here, a crisis-management team is keeping your emergency situation alive and present, a trusted voice is urging you to come to terms with the past, and a steady supply of “The Show” is available for all the distraction, escape and pleasure you crave. In one sense you’re the survivor and this is your refuge. In another, you’re the disaster waiting to happen. Kidd Pivot and Electric Company Theatre. Tiffany Tregarthen and Jonathon Young in Betroffenheit. Photo by Wendy D Photography. Companhia Urbana de Dança tears up the stage with a high-energy fusion of hip-hop, samba, capoeira, and contemporary dance in boldly imaginative choreography by Brazilian choreographer Sonia Destri Lie. Composed of seven immensely talented young men and one woman from Rio de Janeiro on their first Canadian tour, this poetic and explosive company stuns with stamina-testing solos and jaw-dropping group movement that defies the limits of physicality while retaining choreographic rigor. Alternately mesmerizing and rippling with adrenaline and raw energy, these two works explore the cultural roots of Brazil and the gritty life stories of the dancers themselves. Companhia Urbana de Dança. Photo by Christopher Duggan. Visit the DanceHouse website for more details! ~ by DanceHouse on April 13, 2015.